So I’m reading one of our new school library books during my 9th period planning time today. I’m almost to the end of this amazing, amazing book with a main character I love more than any character I’ve met in a long time, and I’m weeping all over the attendance sheets, when a kid walks up to my desk. “Yes?” I look up, tears streaming down my cheeks, my face red and puffy, as if I’ve been stung by many angry hornets. “Sorry. I was just at a really good part.” I hold up my book. “Oohh…” The kid is a reader and understands. “I just need a computer pass.” He gets it, copies down the title of my book, and leaves me to finish the last two chapters. There’s a reason it’s on Fuse #8’s list of Newbery possibilities for 2009. I could go on and on, but I’ll just direct you to her review and say this is one that you need to read. 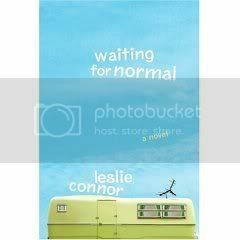 This entry was posted in Uncategorized and tagged leslie connor, waiting for normal. Bookmark the permalink. Both comments and trackbacks are currently closed.